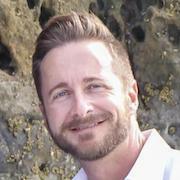 I’m not only a macro counting author and certified coach for HealthyEater.com but I’m also a member of the club! And, I’ll be the first to testify that a macro-based diet is transforming not only my physique but also my relationship with food. At the time of writing this, flexible dieting has helped me to lower my body fat percentage to 8.6%, which is the lowest it has been in all my 42 years on this planet! Not obsessing about food choices. Making great gains at the gym. 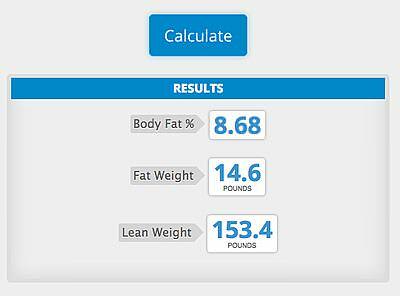 My latest body fat percentage results. I’ve never been obese or even significantly overweight, but this doesn’t mean I’ve always been fit nor healthy. Until my mid 30’s I ate whatever I wanted and worked out sporadically. Although I dreamed of having a great physique, I lacked the motivation and knowledge to help me get there. In my mid 20’s I did start to make changes to my diet that allowed me to experience the way those changes can make a big difference. I first gave up soda on a daily basis and switched to plain water. I was amazed by how much better I felt and how much better my skin looked. However, it wasn’t until my mid 30’s that big changes came when I decided to quit my job, sell my house, and live overseas. After some traveling around I eventually settled in New Zealand and there is where my fitness and healthy eating journey really started. Fitness-wise, there were tons of mountains to conquer and mountain bike trails to ride and I was nowhere near as fit as the Kiwis I was hanging out with and that had to change. Diet-wise, New Zealand lacks a lot of the junk food, fast food, and huge portion sizes America is constantly enticing us with, so it was easier to eat less, eat more fresh fruits and vegetables, and to eat higher quality food in general. Overall, I became a lot more active with hiking, surfing, biking, going to the gym regularly, and eating better. I began to see results and this motivated me even more. I will admit that before using a flexible diet I’ve jumped on my fair share of nutritional bandwagons over the last 6 years prior to starting the flexible dieting lifestyle. But, all of these bandwagons had a few things in common. How lame is that? And, it’s no way to live or be a friend. Dan, another writer on this site, first introduced me to flexible dieting and I was at first appalled by the premise that people were being encouraged to eat things like Pop Tarts and ice cream to lose weight. After all, Pop Tarts are one of the worst foods ever concocted in a lab and how could a site called Healthy Eater support the notion of eating them? It took some convincing, reading success stories, and seeing physique transformation pictures for me to finally be willing to give it a try, but I did, and haven’t regretted it a day since. Now I still think Pop Tarts are disgusting, but I now understand that one here or there will not hinder one’s health nor progress as long as they fit within a person’s macro goals. I found my TDEE and macro levels using our calculator, entered that data into MyFitnessPal and ran with it. After all, if I was going to assist people on this website, I should at least give it a try, right? Since then, flexible dieting has completely overhauled my relationship with food and eating as well as transformed my workouts and the ability to reach my long dreamed about goals. I now have more energy at the gym because carbs are allowed. This extra energy has caused gains at the gym. This all was made possible by being aware of and sticking to my TDEE as well as eating according to my personal macro amounts. So simple, but so rewarding! 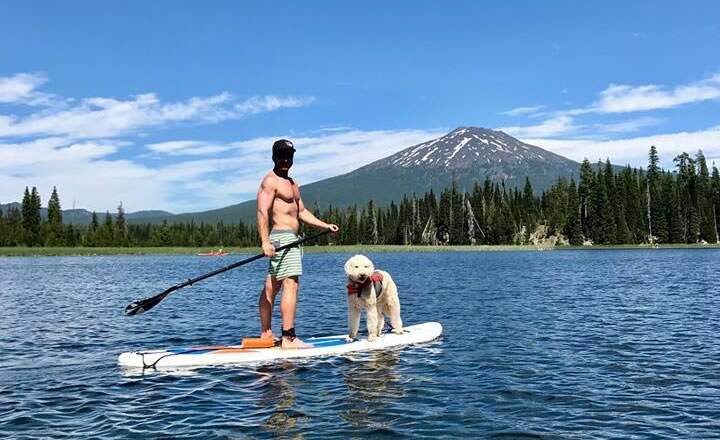 I now live in Bend, Oregon and because of what flexible macro dieting has taught me – I’ve been able to maintain my goal weight and fitness lifestyle for many years. My progression since starting flexible dieting. Don’t worry, I haven’t given up on healthy eating. I still eat really healthy 85% of the time. I eat a lot of fresh vegetables and fresh fruit every day as well as a lot of lean chicken and fish as my protein sources and healthy fats. I love being in control of what goes into my body and no longer do foods or meals take me by surprise. The biggest thing that kept me from my goals was my splurging on the weekends. Looking back, I probably ate upwards of 4000 calories on Saturdays and Sundays without doing much exercise those days. No matter how “good” I was during the week, I couldn’t drop below 11% body fat and this crept up even further after the holidays. Flexible dieting has taught me to be consistent even on the weekends, which has allowed me to break the 10% mark and go even further towards my overall goal of 7%. So, the reason that I’m so passionate about counting macros is because of what it has done for me personally. I firmly believe that, just like me, it will help so many people finally reach their goals, give up crazy diet obsessions, and start eating and enjoying food again. I would love to help you reach your goals too! I’m a certified specialist in fitness nutrition and have now coached over 400 clients. Find out more about my macros coaching options here. Disclaimer: Individual results may vary based on a person’s unique health profile and how accurately they track their macros and adhere to their calculated TDEE. I am really interested in purchasing your coaching plan. I have a few questions though before I purchase. I only have around 10- 15 lbs to lose but I calculated my macros using your lose calculation (I’ve only been doing it a week) and I’m nervous I’m cutting too much too fast and will plateau. 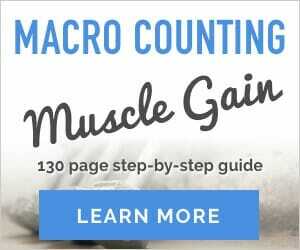 With your program will you help give me my initial macros and then help adjust for maintain? Also, help make adjustments in general? Thanks and your story is amazing! Hi Leslie, Thanks for reading my story and thanks for your interest. If you sign up for coaching, I would look at all your lifestyle factors as well as exercise and calculate a rest day and exercise TDEE that starts at an estimated 20% calorie deficit to prevent a plateau. I’d also be monitoring your progress and adjusting things as needed so if you get within 5 pounds of your goal and want to shift more focus to building muscle, I’d adjust things to accomplish that. I’ll also calculate your maintenance macros for you when you do reach your goal and this is even if it is after the initial 8 weeks of coaching. Let me know if you have any further questions. I am really interested in starting to count my macros and progress towards my fitness goals. I was wondering if the coaching plan took into account injuries? I recently had a back injury and i cannot put weight over my shoulders (such as squats). Is this something that can be tailored to? Thanks in advance! Hi Lexie, Thanks for your interest and it sure does. I take all that into account when assessing what your macro needs should be. Hi Ted, how are you, My name is Eve, I am 53 years old and i am eager to learn about fitness and nutrition , i do need to loose 20kg , with negative experiences of yo yo dieting and eating disorders , i need to be taught on how to eat and exercise the right , i am looking for someone that can guide me about Nutrition and fitness. I need your Help when can i commence and how does this all work. Hi Eve, Thanks for your interest and sorry for the delay. You can see our coaching options here and also an explanation of what all is involved with each level. Hi Jodie, you probably don’t have your exercise TDEE calculated correctly and you should also be eating less on days you don’t workout. Hey Ted, I’m looking to get started with ‘IIFYM’ and was wondering, if I’m happy at my current weight/size but want to reduce body fat, do I need to go with maintenance calories or a 10% deficit? Hi Sam, You would need to calculate at a 10% deficit if you want to cut fat. The body has to be in a negative energy balance to tap into its fat reserves. Hi Ted! I used the calculator and it gave me my macros, but I’m confused. Are they supposed to be those numbers everyday, or do they change? Hi Hannah, It depends . Some people have a set for their workout days and then a sedentary set for their rest days. Others just eat the same everyday. I think 2 sets works better if you just have 10 or fewer pounds to lose and it also teaches you to adjust your eating based on how much activity you do. hello, I am new in this site coworker told me about macronutrients and i want to give a try since is difficult to loose weight after i got my thyroid removed, that happens in 2006 since then i have to take medicine everyday synthetic hormones that “produce” what ever the normal thyroid produce. Anyway i just wondering if my fail loosing weight has to do with the medicine or something else? Hi Zulma, How often do you have your thyroid hormone levels checked? The thyroid does play a huge part in regulating your metabolism so it’s important that the levels are where they need to be. Also about how many calories do you consume a day and what’s your exercise level like? Lots of talk about flexible dieting, so I did my research and decided to give it a try. Only on day two but the amount of food I’m consuming seems excessive. It may be due to the fact that I’m eating things I haven’t eaten for years, carbs mostly. Will give this a try and see where it leads me. I agree with Rayca being female and older does present it challenges with weight loss and muscle gain. OMG! Ted, you healthy hunk of man. Your progress is amazing. I think diets work differently for women than men, though. And like you said, you weren’t really what’s considered overweight. For me, I seem to have to brace myself and just dive into a diet. Mostly fruits and veg really works. I also think as you get older, the stricter you need to be. It can really be a struggle to rev that metabolism. Thanks Rayca 🙂 I agree, it is easier for men because testosterone make it a lot easier for us to gain muscle. But I would encourage you to check out flexible dieting It really has been helping a lot of people of all ages. Hi Rose, It is but can be challenging. Are you weight training? What’s your diet like? Over a pound a month is pretty good actually. As a woman you will have a harder time without all that testosterone in your blood and gaining muscle will be a slow process. I have started eating with the Flex Plan. I do not feel full with so little fat and protein. Carbs do not make me feel satiated. I am using the macro counter. Hi David, What’s great about the flexible diet is that you can adjust your macros to suit your preferences. The percentages aren’t set in stone so adjust to what works for you. I have been eating Paleo but struggling to lose some body fat. Thought I would give this plan a try. Would reducing the carb intake from 50% to 25% reduce my chance of losing the body fat while maintaining my current weight? I do crossfit 3x a week too, plus other activities. I don’t think so. I followed a low carb diet for a while and I never achieved below 10% body fat with it. Carbs aren’t bad and help fuel your workouts. The main thing for losing or gaining is being true to your TDEE. That’s one of the best posts I’ve read. What an inspiration ! Also, What’re your current macros? Thanks Dan currently my macros are 40% carbs 30% protein and 30% fat but I base this on the amount of exercise I do so the grams per day fluctuate. I cap my protein at 1 gram per pound of body weight and eat any extra calories as carbs. On rest days I eat at my sedentary macros. Awesome! What are your calories? My sedentary TDEE is 1700 but then changes depending on how many calories I burn during my exercise. Ted, what’s your carb % on sedentary days? My percentage is the same for both rest days and exercise days, but of course, the gram amount increases on exercise days. Currently my carbs are at 40%. Thanks Ted. I have been using the flex diet program for almost a month. Like it, but am not losing any body fat. I am not over weight, maybe a bit under. Been trying to stay true to my TDEE, which is 1895 cals. I have gained 6 lbs the past few weeks, which is good, but it must be water weight from the extra carbs I am eating. I was using Keifer’s Carb Night protocol to lose the extra body fat around my waist, but have stalled with BF loss. Have tried many programs to lose the BF around my waist, just like you. I would like the Flexible Diet plan to work. I am just under 6 feet tall with a medium build, am 61 yrs old (could age be a factor?). Am working on improving my sleep pattern, too. Any suggestions?? 6 pounds isn’t all water weight, nor do extra carbs make you retain water. Hydration fluctuations only account for a 1-3 pound variation at most. Yes, age is a factor unfortunately, but not unfixable, just makes it more challenging. . What are your workouts like? Workouts: Crossfit 3x a week. I go hard for the first metcon and scale down the effort on day 2 and 3. We do weight lifting each day. Also, I do not go over 12 to 15 minutes in the metcon portion for recovery purposes. I walk too for exercise and do yard work. Great! Are you adjusting your TDEE based on your calorie burn? The number you noted looks to be a sedentary TDEE. The TDEE number is for sedentary days. I am eating around 1895 cals on both sedentary and workout days. The past 10 days I have increased the calories to approximately 2100 to 2200 cals on workout days. My gut looks extended when eating that many calories, so I tend to reduce the calories. I am eating half my calories at dinner too. 3 years ago I gained 30lbs in 3 months, thinking that this might help me gain muscle mass. I did gain a little muscle but not enough to burn the body fat, especially around the waist. The plan was to cut weight, which you have written about, bulking and cutting. I cut the weight but had MORE body fat to lose than prior to the weight gain. So, this taught to me as to never eat too much again, in order to gain muscle or mass. According to you and the pictures show your success, this diet plan does work as long as I stay within the needed calories and macronutrients. Here’s hoping it does! Just an FYI: My body composition is pretty much where you were in the first picture. According to the calculator my TDEE is 1895 cals, 2241 for maintenance, and, 2448 cals for moderate activity workout days. So, I will gain more weight but as long as I eat enough I will lose body fat. Wow! I’ll take that any day!